The University of Puerto Rico at Río Piedras campus. Its distinctive clock tower is a landmark of both the campus and Río Piedras. Río Piedras is a former municipality of Puerto Rico, which was consolidated with the municipality of San Juan, Puerto Rico in 1951. It was founded in 1714, and has been the home of the University of Puerto Rico's main campus since 1903, earning the popular name of Ciudad Universitaria (University City). Río Piedras' origins go back to 1714 when a settlement along the shores of the Piedras river was recognized by Governor Juan de Rivera. Originally known as El Roble, it eventually adopted the name of the river that crossed its territory (Río Piedras in Spanish). During the nineteenth century, most of its territory was used for agricultural and livestock-raising purposes. Sugar cane, cotton and coffee were some of the goods produced during this era at the municipality. On May 12, 1903, the University of Puerto Rico was founded in Río Piedras. The university was a central part of the development of Rio Piedras, both in housing and economically. Even though the campus covers a very small portion of the territory, it is considered the unofficial symbol of the old town. The Río Piedras Campus is recognized[by whom?] as the main campus in the University of Puerto Rico system. The Botanical Gardens of the university are also located at Río Piedras. The municipality became part of the capital city of San Juan on July 1, 1951, after the approval of Project 177 of the House of Representatives of Puerto Rico. 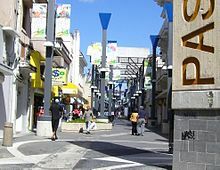 Following the annexation of Rio Piedras, the city of San Juan, and its surrounding area now including Rio Piedras, quadrupled its former size. The last mayor of the municipality of Río Piedras was Ángeles Méndez de López Corver. The flag of Río Piedras consists of a yellow cloth with a wavy blue stripe. The stripe has small white stones crossing it, and symbolizes the river that gave its name to the former town. The yellow background represents the sun, progress, and the future. The region is mostly flat due to its location in the Northern Coastal Plains of the island. The highest regions are located at the south, mainly in the Caimito and Cupey barrios. The Río Piedras (or Piedras River) which gives name to the area crosses the region. San Juan (light gray) and Rio Piedras (yellow) before annexation. Buen Consejo, Capetillo, and Río Piedras Antiguo made up the original urban area of the municipality of Rio Piedras. According to the 2000 census, Río Piedras had a population of 332,344. That is more than any municipality in Puerto Rico and 77% of the population of San Juan. Río Piedras first mayor was Juan de la Cruz in 1814. The last mayor of the municipality of Río Piedras was Ángeles Méndez de López Corver. The Puerto Rico Department of Corrections and Rehabilitation operates the Hogar Intermedio para Mujeres in Río Piedras, which opened in 1996. Río Piedras is perhaps more known for being the site of the main campus of the University of Puerto Rico. Located in downtown Río Piedras, the university has more than 20,000 students enrolled and a faculty of more than 1,000. Other universities located in what was known as Río Piedras are the Polytechnic University of Puerto Rico and the Interamerican University of Puerto Rico, Metropolitan Campus. Río Piedras also has several public and private schools distributed through several regions. Public education is handled by the Puerto Rico Department of Education. Rio Piedras is served by the Tren Urbano Metro system with stations at the University of Puerto Rico, Rio Piedras and in downtown Río Piedras. Even though these two stations are considered the current stations at Río Piedras, most of the stops of the train in the municipality of San Juan are located in areas that were part of the municipality of Río Piedras prior to 1951. At the heart of Río Piedras lies the Avenida José de Diego, a one-kilometer pedestrianized street with stores and shops. The Río Piedras Plaza del Mercado (Marketplace) is the largest of its kind on the island and features a series of shops that offer goods and services. Ponce de León Avenue is popular with bookstores and small theaters and with students, faculty, and intellectuals in the community. Roberto Clemente's house is located in Rio Piedras , where a memorial is visible in the back yard. ^ Merriam-Webster's Geographical Dictionary Third Edition. Springfield, Massachusetts, U.S.A.: Merriam-Webster, Inc. p. 993. ISBN 0-87779-546-0. ^ "Breve Historia de Río Piedras". enciclopediapr.org (in Spanish). ^ "Perfil de la Población de Mujeres Confinadas Año 2015" (Archive). Puerto Rico Department of Corrections and Rehabilitation. Retrieved on December 9, 2015. ^ "A 20 años de la tragedia en Río Piedras" (in Spanish). November 21, 2016. Retrieved November 21, 2016. Wikimedia Commons has media related to Río Piedras. Wikivoyage has a travel guide for San Juan/Rio Piedras. This page was last edited on 16 April 2019, at 14:13 (UTC).